Obama campaign: Its secret for getting voters to the polls. Are You Going To Vote? Do You Promise? The Obama campaign’s secret for getting voters to the polls. Courtesy United States Student Association. A couple weeks ago, Aletheia Henry posted a picture on Instagram of a cardboard box filled with the handbills on which the Obama campaign asks supporters to sign a commitment to vote. “Commit Cards = Votes & we have a lot of them!” Henry, who is Pennsylvania’s general-election director for the Obama campaign, wrote on Twitter. Henry’s equation reflects a mathematical assumption widely accepted within Obama’s campaign and more broadly across the electioneering left: that a citizen’s written pledge to do something is just about as good as their having done it. Nearly a decade’s worth of experiments, conducted largely by nonprofit groups that specialize in turning out nonvoters, have inspired a spate of autumnal promise-harvesting, including a “Pledge to Reg” effort aimed at enlisting nonvoters on college campuses and emails to supporters directing them to a “Commit to Vote” website. Visitors to the page are encouraged to announce their commitment to vote on Facebook and to click an “I Make the Pledge” to volunteer button. Faced with the strategic challenge of re-engaging the coalition of supporters who first elected Obama, the president’s campaign has turned frequently to the behavioral sciences for guidance. As Buzzfeed noted last week, the campaign has taken to letting citizens know that many peers who share their first name are registered to vote across the country—an exercise in what behavioralists call social pressure. But the mechanism of soliciting and enforcing promises may be the most ubiquitous tool in the campaign’s psychological arsenal. Smith joined Rock the Vote in 2007 and since then has used the group’s mobilization programs to continue to test the effectiveness of collecting pledges and issuing reminders across platforms. Now Rock the Vote, like the Obama campaign, collects commitments online and follows up with pre-election reminders by email, phone, and text message. The most popular method may be the paper cards that citizens are asked to sign, often unaware that it will be sent back to them just when it is time to vote—a vivid reminder, in their own hands, of obligations they have made and are expected to fulfill. The commitment process also creates a new stage of meaningful interaction between registering and voting. 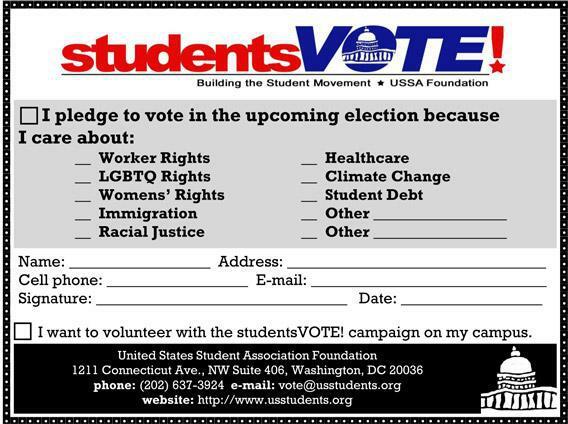 For the United States Student Association, which is active on college campuses in nine states, having pledge cards at tables where the group is running registration drives gives canvassers another reason to halt passers-by who claim to already be registered. “You can say, ‘If you’re registered to vote, that’s great—sign a pledge card,’ ” says USSA president Tiffany Dena Loftin. Unlike some psychological techniques, which are typically focused on infrequent voters, the Obama campaign appears to be seeking out pledges everywhere. Each promise is also an opportunity for a voter to voluntarily update personal information in the campaign’s files and draw out some new pieces of data, too. Obama won’t even accept your online promise to vote unless you hand over a phone number first.